On the Dell website, it takes me around 5 to 6 clicks to get to the Dell XPS 13, and even then, there are two versions, the 9360 and 9370, and no clear notes on the site for the difference between the two (the 9370 is newer, has more features, and a smaller battery). 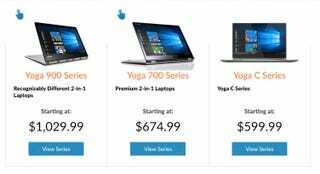 If I use the search function found on the front page, it is faster, but Dell also helpfully offers choices from previous years, with no clear note that they’re older beyond that laptops cost less. A person who isn’t paying attention might easily buy an Dell XPS 13 with last year’s processor and not realise their “deal” is actually marked down old stock. Look at how many different ways I can search for the same information. No wonder it takes me a few tries to click the right series of links to get to the Yoga devices I’m looking for. Which leads me to this page. I’d cooked up all nature of personal theories to rationalise atrocious user experience, ranging from “companies are evil and hate us” to “I am an idiot, and so is everyone else on the internet.” Curious to know what was true, I reached out to HP, Dell, and Lenovo, the three largest laptop makers, and asked why their websites were so...complex. Dell and Lenovo are still looking into it, but HP let me speak to Carmen True, the Head of Digital Experience at the company. She oversees the design of HP.com. Each of us comes to a website like HP.com with a different goal in mind. I pop in because I need the specific page for a specific laptop. You might come by because you heard how much Gizmodo likes a particular device, or you’re just curious to see what your favourite laptop maker has cooking. Our needs are very different, as is how we might want to navigate towards a solution, so the website designers have to take into account all the different ways people might think about a product. They have to imagine the journey for you and me, and also some IT person looking to buy a fleet of laptops, and my mother...who still can’t click on that damn link I sent her in Apple Messages.